It is sometimes useful to display your prototype pages as a diagram rather than as a tree view. 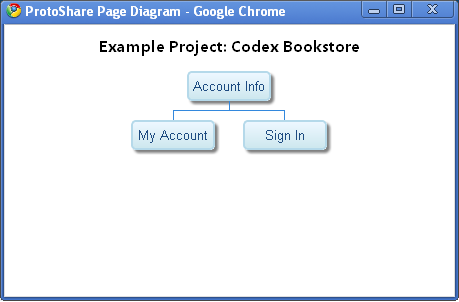 The selected page and its subpages are displayed in the diagram. To display all pages, select the Home page. 3. Display the pages as a diagram. Click View > Page Diagram in the Pages panel toolbar. The diagram appears in a new window. Click a page in the diagram to select the associated page in the Pages panel. The diagram for part of the Example Project is shown below.